Warning – this is not virtual! 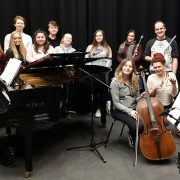 For three years Annan based music charity, Absolute Classics has been working with local young people on a composition project focussed on games music. The project, IMMERSE, was born out of Absolute Classics’ work mentoring young people from Dumfries & Galloway in the creation of original compositions and video games soundscapes. Professional composer, Luci Holland was brought to the region to mentor the young participants, using classical compositional techniques to help express the young participants musical ideas. Cairngorms, mysterious happenings… and an interactive element where you get to decide which way the concert goes next.